I had my first Escape Room experience last weekend. You may recall my post about History Mystery a while back. Well, the stars aligned in a way that saw me taking my son, a friend’s boy and an old schoolmate of mine to Norwich for the last day of the Norwich Game Festival, and a visit to the Guildhall for an hour trapped in an an Escape Room. Though, it wasn’t us that was trapped, it was city’s absent-minded historian who had managed to get himself locked in his own Archive. The override code would only work for one hour every day, and luckily for him, we had arrived in his office just moments before that hour started. But he could not remember what the code should be, he had made all sorts of cryptic notes to himself all over his office to help him remember, and it was our job to decrypt them find the override key-pad and enter the code. If we didn’t get him out this time, after three days trapped in the archive, there was every chance he wouldn’t survive until tomorrow! This premise slightly jarred with us having only just met the same Historian, otherwise known as Richard Crowest of Corvidae, out in the Norwich Games Festival marquee, promoting History Mystery. But never mind, we were all willing to suspend disbelief. And in fact the sense of urgency was reinforced, not by Richard’s imagined peril, but by the understanding that we were competing against everyone who had already played the game or would in future. Our time would be recorded and compared with previous players. One team had managed the complete all the puzzles and free the historian with sixteen minutes still on the clock. Could we do better? Obviously, I can’t reveal the secrets that we found inside the room. That would give teams following us an unfair advantage, but what impressed me was the wide variety of puzzles which meant that everyone from my 11 year old son to my 90, sorry 49 (almost 50) year old school-mate contributed usefully to the problem solving, without anyone feeling patronised by a “children’s” clue or anything like that. We worked together yet separately, shouting codes and discoveries across the room and trying combinations in every one of numerous padlocks (the historian was a very data-security conscious fellow). One clue especially required two of us to work together at different ends of a piece of complex plumbing. But only almost. We released the historian with over five minutes to spare. Not a record breaking time, but given that many parties don’t quite manage to complete the puzzles at all, we didn’t do too badly. It helps that the organisers keep an eye on progress and speak to you on a walki-talky, if you don’t tug hard enough at a padlock for which you’ve actually got the right combination. 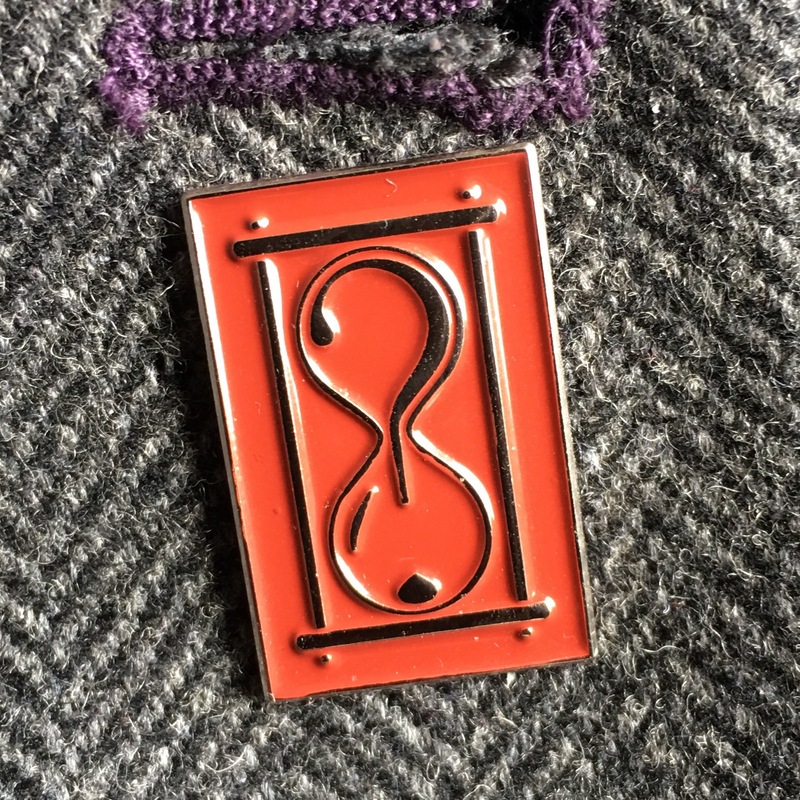 We were rewarded with History Mystery badges (most escape rooms don’t give prizes, so this was a pleasant surprise) and a personal, live thank you from the Historian himself, who had come up from the Game Festival marquee the archive. This live appearance was an honour we shared only with the very first party to try the experience. In fact we did better than them because he took us to a pub and got the first round in! When we’d first entered, I was disappointed by the tidiness of the office. I’d imagined a cluttered and object rich environment full of antique furniture when I booked the session, and was surprised to find that our historian had a desk not unlike that of a local council official. (Which of course he was.) I should have been thankful for the tidy desk though, because my the time we’d finished turning things over, pulling stuff off shelves and emptying lock-boxes, we’d made an almighty mess. We left all that behind us when we went to pub, and the History Mystery crew had the unenviable task of putting it all back together for the next session. Given that we’d scattered padlocks willy-nilly about the room, moved items, stacked boxes (or left them scattered over the floor) I wonder how long it takes to reset the puzzle. I’m sure the crew are well practiced, but I’m intrigued about the operation. It costs each player something over £15 pounds to join in (its more as the group gets smaller), and I am curious about break-even and profit – how quickly can the room be reset, how many sessions can be booked in a day, and how many of those sessions need to be booked for the hardworking crew to get paid and the company to be sustainable? Still, as I mentioned in my previous post on the subject, the Escape Room phenomenon seems to be every growing right now. There’s already a second company operating in Norwich, my boy pointed out that last year’s Van Dyke Vanishments was a sort of escape room, and in way, so was Against Captain’s Orders, the recent Punch Drunk production at the National Maritime Museum. I’ve heard that despite Arts Council funding and a reasonably high ticket price, that venture lost money, but I’m sure we’ve not heard the last of escape rooms in museums and heritage sites. Whether its a way of learning about the past, I’m less certain. History Mystery’s USP is that all the puzzles are based on real historical facts. But given the constraints on time, the players skim over the facts looking for clues. And so all I can confidently recall is that once in the middle ages, the whole city of Norwich was ex-communicated by the Pope. I think it was something to do with Monks getting into fights with townsfolk, but honestly I can’t recall the context, though of course I’m now inspired to look it up. Outside the Guildhall we had a look around the rest of the games festival. Meeting among the crowds, the developers of the current iOS timewaster of choice Super Arc Light which was fun but has nothing to do with cultural heritage. (Though, touching upon the yesterday’s post, this has a game with the simplest of interfaces – “touch the screen, anywhere” and yet is fiendishly difficult.) Slightly more historical (but only slightly) was Ironheads. We managed to grab the last two fights of the day, one for the boys, and one for me and my old school-friend. It’s good to know I still have it where it counts (he said smugly). The Walk, which uses game mechanics such as the acquisition of badges and and interactive story, in a (failed) attempt to get me to take more walking exercise. It’s about time I addressed the issue of Gamification. It’s a word that gets bandied about a great deal, and one which has inspiring proponents like Jane McGonigal. But what does it actually mean? Nick Pelling lays claim (in this 2011 blog post) to coining the word in 2002 when he “began to wonder whether the kind of games user-interface I had been developing for so long could be used to turbo-charge all manner of transactions and activities on commercial electronic devices [his emphasis]– in-flight video, ATM machines, vending machines, mobile phones, etc. Unsurprisingly, this was the point when I coined the deliberately ugly word “gamification“, by which I meant applying game-like accelerated user interface design to make electronic transactions both enjoyable and fast.” (I’m glad he calls it “deliberately ugly” – I was ready to rant on about it being a linguistically unnecessary Americanism when I first heard it. I’m over that now). Of passing interest is his 2003 consultancy web page (looking VERY Web 1.0) which announces gamification to the world. That consultancy shut up shop three years later because, broadly, no-one was interested. Its interesting to note that what he was interested in doing was bringing game-like interfaces to electronic devices. Which, though I’m not sure he would agree, is not what gamification has come to mean. Towards the end of his post, he insists that “the underlying idea of gamification [is] making hard things easy, expressive, near-effortless to use.” Games (and computer games in particular, since this is what Pelling is talking about) may offer interfaces that are apparently easy to pick up and start playing, but they are (mostly) designed to get more difficult, that is part of the challenge of games, the challenge that contributes to (successful) games becoming intrinsically motivating. And its motivation that is at the centre of the current use of the word. In their 2014 literature review Hamari, Koivisto and Sarsa say “gamification can be seen to have three main parts: 1) the implemented motivational affordances, 2) the resulting psychological outcomes, and 3) the further behavioral outcomes.” Their review covers 24 studies of gamification, and categorizes all the “motivational affordances” mentioned in those studies: Points; Leaderboards; Achievements/Badges; Levels; Story/Theme; Clear goals; Feedback; Rewards; Progress; and, Challenge. These resonate with (but do not match) some of the emotional models I’ve been reading about elsewhere. Of course Points, Leaderboards, Achievements/Badges, Levels and Rewards can all be summed up with the Acquisition trigger that Sylvester mentions. Challenge exists in both models. Story and Progress fit with Sylvester’s character arc, and Theme (arguably) with his environment trigger. I’m a bit curious about “Feedback”, because, surely everything a system does in response to the user is “feedback” isn’t it? My personal experience supports all these conclusions. Three years or so back, I took delivery of a new company car, that after a few hundred miles rewarded me with a “cup” to celebrate my fuel-efficient driving. I endeavored there-after not to lose any of the graphic flower petals each indicated things like keeping to legal speeds, not braking heavily etc which had contributed to my cup. You can chalk that up as a “positive benefit”. Other attempts have not been so successful – the insurance company Aviva have recently started to use gamification to sell and reduce the costs of car insurance. I downloaded the app out of curiosity and for the purposes of this study. It was infuriating, and lasted only a week on my phone. The novelty had obviously worn off. 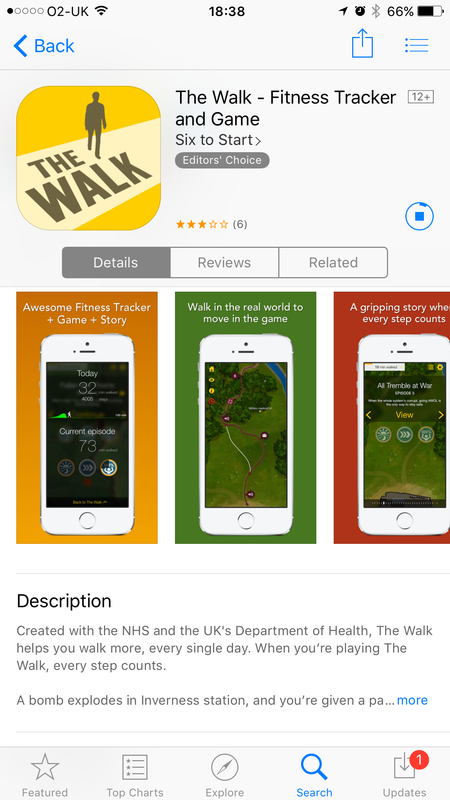 And about a year ago I downloaded another app, The Walk (illustrated above), I responded badly to its needless badges and dull story. I used it less and less and eventually deleted it from my phone. It was a recent bout of very high blood pressure and a stern warning from my doctor that worked better to motivate me towards a healthier lifestyle. I’m speaking at the Attingham 2016 Conference, organised by the University of Nottingham. It clashes with the recently announced referendum, so its a postal ballot for me! Is there a place in heritage spaces for the gamification of adult learning? Today’s fifty year olds were at school in 1980’s, when the ZX80, then the ZX81, the Spectrum, the BBC micro, and host of other cheap and accessible computing devices popularised digital gaming. How do the expectations of this first “Gamer Generation” differ from the adult learners that cultural heritage sites have welcomed in the past? Gamification (Hamari et al., 2014, Kapp, 2012, Marczewski), the application of game mechanics in non-game contexts, has been a feature of learning since before the word was coined in 2002. Non-digital games have been used in the classroom and in less formal environments, for many years, to encourage people to learn about their world. Generally though, such games have been aimed at non-adult audiences. The term gamification has come to prominence in recent years mostly in reference to digital games, and an adult audience. Heritage organisations have been using digital game technology to interpret cultural heritage since at least 1996, but it’s only since the creation of mobile digital devices that museums and other heritage sites have tried to harness game technology on-site to help interpret their stories (Fosh et al., 2015, Ioannidis et al., 2014, Roussou et al., 2013, Salomonsson, 2015, Treharne et al., 2013). Digital games, especially immersive story-games, and cultural heritage sites share a multimodality (Champion, 2015, Roppola, 2013) that suggests games may work very well for adult learning in heritage spaces. However, heritage sites that have invested in projects involving gamification have often been disappointed in the numbers of visitors participating in such efforts. This paper will chart the brief history of digital games in heritage learning, and share research into gamers’ attitudes to play in cultural heritage spaces. Exploring the opportunities and challenges that game mechanics offer heritage spaces, I will argue that some elements could be used to make cultural heritage sites more responsive environments, without turning adult learning into a game. So, that’s the abstract, I better get on with the paper. I might need to find some more up-to-date texts as well, as some of these come from when I first started my studies. If anybody has published anything recently that touches on the above, give me a shout. CHAMPION, E. 2015. Critical Gaming: Interactive History and Virtual Heritage, Ashgate Publishing, Ltd.
FOSH, L., LORENZ, K., BENFORD, S. & KOLEVA, B. 2015. Personal and social? Designing personalised experiences for groups in museums. 19th Annual Museums and the Web Conference (MW2015). Chicago, IL. HAMARI, J., KOIVISTO, J. & SARSA, H. Does Gamification Work? — A Literature Review of Empirical Studies on Gamification. System Sciences (HICSS), 2014 47th Hawaii International Conference on, 6-9 Jan. 2014 2014. 3025-3034. IOANNIDIS, Y., BALET, O. & PANDERMALIS, D. 2014. Tell me a story: augmented reality technology in museums. The Guardian, April 4. KAPP, K. M. 2012. The gamification of learning and instruction: game-based methods and strategies for training and education, John Wiley & Sons. MARCZEWSKI, A. Gamification: A Simple Introduction and a Bit More, (self-published on Amazon Digital Services, 2013). Kindle edition, Loc, 1405. ROPPOLA, T. 2013. Designing for the museum visitor experience, Routledge. ROUSSOU, M., VAUANOU, M., KATIFORI, A., RENNICK-EGGLESTONE, S. & PUJOL, L. 2013. A Life of Their Own: Museum Visitor Personas Penetrating the Design Lifecycle of a Mobile Experience. CHI 2013 Extended Abstracts. Paris: ACM. SALOMONSSON, L. 2015. Leveling-Up With Cultural Heritage: Aspects from Gamification and Alternate Reality Games. TREHARNE, H. E., TROMANS, N., SCARLES, C., SCOTT, M., CASEY, M. C. & CULNANE, C. 2013. Transforming the Visitor Experience with Augmented Reality. I’m still enjoying Eric Champion’s Critical Gaming: Interactive history and virtual heritage. I wanted to write today about his chapter four, which lots at the problems of learning history through games. There’s all sorts of things I like in here, and only one thing I take a different view on. It is very common that you change a story like this depending on your audience. If the people listening do not seem impressed by the hero’s strength, you add more details, more events, descriptions and dialog. Your goal when telling the story is not be give an exact replication of how the story was told to you. What you are trying to do is to copy the impact the story had on you and any change you can do in order to accomplish this is a valid one. If you wish the audience to see a deeper truth beyond the words (of, say, a historical text), what are you aiming for and how do you know whether the audience has understood the meaning the the designer has attempted to convey? He discusses thesis-based kikset visualisation machines, simulations of cities or empires with students can mod to see the impact of decisions on the virtual “history”. (Champion mentions that Historian Neil Ferguson doesn’t think much of the likes of Civilisation, but does endorse the Making History series. Games can be designed to use real or interpreted media – I’m think here of the Versailles 1685 art references. Champion conflates this with game mechanics used in VR in actual places, and mentions the work of CHESS. Champion also gove numerous examples of building computer game mechanics into the physical word, objects in a real sand-pit with RFID tags that can like on virtual media, for example. Or moving tokens about an a phyiscal table that allows access to Point of View cameras on actor’s (or in the example he gives, reindeer’s) heads. …as thought that’s a Bad Thing. Which I guess it might be if you are primarily seeking immersion or presence, as the VR guys call it. But in fact I’m coming to the conclusion that that feeling (which I’ve dubbed in a couple of presentations “the Apotheosis Moment”) is something special about games, which in a way, I’m trying to recreate in physical cultural heritage environments. Mimic NPCs – Champion’s “Reverse Cultural Turing Test” as mentioned in a previous post. Despite all these problems, Champion doesn’t believe we should stop trying to explore history though games. Indeed he argues that some of the limitations that games might have, working with them allows us to experiment with history in ways we might not have considered, and maybe, just maybe gain insights that we might have missed. Which is just as well, as he has written a whole book on the subject. A final thought I’m having as I re-read this post. Champion’s book is about creating virtual environments, but there’s some interesting philosophy here that historical re-enactors and costumed interpreters might also benefit from. “Escape the room” games are a sub-genre of computer adventure games. Very often the first challenge in the old text based adventure games was to get out of the room where the adventure starts. With the development of point-and click graphic adventures (like my old favourite, the Monkey Island series) and especially the creation of what we now call Adobe Flash, the idea of making a mini-adventure that was ALL about getting out of a richly detailed room, took flight. It didn’t take long for people to cotton on the the idea that while the fantastic, huge, worlds of most adventure games couldn’t be re-created in real life, re-creating a single room was a possibility, and could even make a pretty good business case. So in the last few years, a nascent Escape Room industry has grown rapidly, from Japan initially, to locations all over the world. You can escape from Magic Shows, Baseball Parks, Time Travel labs, Bank Heists, Prohibition speakeasies, and even, in London, “Lady Chastity’s Reserve” (didn’t ask, didn’t look). But all these a made-up stories about imaginary places. I’m sure the set design looks lovely, but players might as well be playing in an industrial estate. What History Mystery brings to the table, are real, exciting places, with the patina of real history*, and stories researched from and interpreting the history of that place. The first game on offer involves rescuing a Norwich archivist, trapped his own vault. History Mystery launched at the end of January in Norwich, and the company hopes to expand across the country, as they strike deals with suitable historic locations. I haven’t had a chance to play in a game yet, but it looks fantastic I hope to take a trip up there as soon as I can. Have any of my East Anglian chums heard about it, or given it a go? I wish these guys every success – I’d love to see real history turned into adventure games all over the country. I’ve been reading Eric Champion’s Critical Gaming: Interactive history and virtual heritage. Eric asked his publishers to send me a review copy, but none was forthcoming, and I can’t wait for the library to get hold of a copy – I think I was to quote it in a paper I’m proposing – so I splashed out on the Kindle edition. I think of it as a late birthday present to myself, and I’m not disappointed. Multimodality can help to provide multiple narratives and different types of evidence. Narrative fragments can be threaded and buried through an environment, coaxing people to explore, reflect and integrate their personal exploration into what they have uncovered. Which is surely what all curated cultural heritage spaces are trying to achieve, isn’t it? (Some with more success than others, I’ll admit.) Champion is referring to the multimodality of games and virtual environments, but it strikes me that museums and heritage sites are inherently multi-modal. It sent me off looking for specific references to multimodality in museums and heritage sites, and indeed, I found a few, this working paper for example, and this blog, but there are not many. But I digress. I’ve started Eric’s book with Chapter 8 (all the best readers start in the middle) Intelligent Agents, Drama and Cinematic Narrative, in which he examines various pre-digital theories of drama (Aristotle’s Poetics, Propp’s Formalism (with a nod in the direction of Bartle and Yee) and Campbell’s monomyth), before crunching the gears to explore decidedly-digital intelligent agents as dramatic characters. Along the way, he touches upon “storyspaces” – the virtual worlds of games which are by necessity incomplete, yet create an illusion of completeness. His argument is that there is a need for what he calls “Cultural Agents” representing, recognising, adding to, or transmitting cultural behaviours. Such agents would be programmed to demonstrate the “correct cultural behaviors given specific event or situations” and recognise correct (and incorrect!) cultural behaviours. For example, I’m imagining here characters in an Elizabethan game that greet you or other agents in the game with a bow of the correct depth for each other’s relative ranks, and admonishes you if (in a virtual reality sim) you don’t bow low enough when the Queen walks by. Then he shifts gear again to look at Machinema (the creation of short films using game engines, which I learned about back in Rochester) as a method for users to reflect on their experience in-game, and edit it into an interpretation of the culture the game was designed to explore. Its a worthy suggestion, and could be excellent practice in formal learning, but I fear it undermines the game-play itself, if it becomes a requirement of the player to edit their virtual experiences before comprehending them as a coherent narrative. Also in all though, I can already see that the book will be an enjoyable and rewarding read. I honestly don’t know where I’m going with this, or indeed if I’m going anywhere at all, but I wanted the give it a try. So I’ve spent most of the day re-reading bits of Panksepp, Ekman, Lazarro and Sylvester and seeing if each of the models lines up to tell me anything interesting. Along the way I’ve made some other notes. For example – contentment, relief and satisfaction seem like pretty deepseated emotions that should figure, or have equivalents, in Panksepp’s schema. Where should they go? Are they simply Homeostatic? or are they part of the SEEKING network? Also, a number of things that Lazarro calls “emotions” seem really out of place in this table, are the emotions at all? Or are they behaviours? That said what she calls Schadenfreude, really does seem to fit in the Panksepp’s emotional model – though he doesn’t use that word, he does describe the affect as part of “the dark side of human laughter.” Oh, and I need to see in Panksepp has anything to say about flow. In conclusion I’m not sure if all this work does tell me anything interesting, but you can see the results below and I’m going to sleep on it (after I’ve tidied the dining room). Satisfaction Pleasure from work(S) ?(flow)? Heritage Jam 2015 – sign up soon! I had a great Skype chat today with Neil and Paul from Info-Point. I’d first met them a couple of years back, and wrote about their product here. In fact, I’d put them in touch with one of my client properties at the time, Saddlescombe Farm, that had a problem which I thought Info-point might be the perfect solution for. It was – and Info-point have now supplied solutions to a number of out-of-the-way (and out of signal) National Trust sites across the country. Their challenge is that they are technologists, not storytellers, but sometimes places come to them hoping they can supply the content, not just the platform. To this end, they are working hard at building a network of interpretation designers and content providers, who they hope will use their technology when heritage sites come calling. Afterwards I thought – “Heritage Jam… that too good an idea to be mine. Where have I heard it before?” and a quick Google later, I knew where. York University will be hosting Heritage Jam towards the end of September. I missed it last year, and made a mental not not to miss it this year. OK, so that mental note came back a bit garbled, but it came back in time for me to get myself on the mailing list. Registration opens and closes on the 20th August. So if you want to go, set a reminder in your diary! If you can’t get to York, there’s and on-line participation month kicking on the 20th of August too, so check that out. I ought to watch out for the literature rabbit holes I can fall down. After my last foray into narratives and sociology, I got sucked into another work that was only tangentially about what I’m studying. This one though did at least have a few quotable quotes I might want to use later. He goes on (page 40) to reference “Jerome Bruner (1986; 1991) [who] has argued that humans make sense of the world in two fundamental ways, in two cognitive modes: paradigmatic and narrative. In the Paradigmatic mode the human mind recognises elements as belonging to two categories in a classifying operation.So in this cognitive mode, when we encounter an object, we seek to map it onto already existing classificatory schemes pf objects, trying to work out what kind of object it is. […] For Bruner this mode of cognition is most characteristic of science. So it can the argued that a label in a museum or cultural heritage site, which categorizes an object, can’t connect the visitor emotionally to that object, unless they bring a story with them. But a purely story led interpretation of a site or collection can’t help the visitor understand it. Does any of this leave me any more enlightened? Not particularly, but I enjoyed reading it. 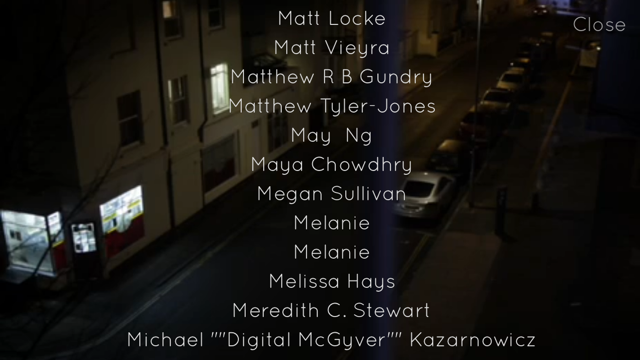 Yesterday I finished playtesting Blast Theory’s soon to be released app, Karen. I don’t want to say too much about it, because I don’t want to spoil any surprises for you, and it’ll shortly (hopefully next week, pending approval, and assuming is ran as well for other playtesters as it did on my device) be free to download for iOS from the App Store. So you’ll be able to try it for youself, Android users will also get their turn, but not quite as soon. Its a culmination of the work on profiling that Blast Theory have been exploring over the last couple of years. Its a great piece of interactive art. I’ll go so far as to say the best interactive story I’ve played. If only because it manages to create a sublime sense of real interaction. I’m not making decisions for an avatar, like John Martsen in Red Dead Redemption, but for myself. I’m telling Karen about me, not about what, for example, Marcus in Blood and Laurels, might do. I can tell the truth or I can lie (in fact I shuffled uneasily between the two) but that choice is mine. Do I change Karen’s story through my decisions? To be honest, I don’t know, I’ve only had time to play through once. But the illusion of true interaction was surprisingly effective. I especially like the use of Lickert sliders to answer some questions, which allowed me to be more “true to myself” than the multiple choice answers available for the other questions. Karen’s in a nuanced story, and sometimes I wanted, but was unable, to give a nuanced reply. I made this! (Or rather, I bunged them a tenner on Kickstarter a while back). Oh, and hey, they are in the news already!